The Strata 2 Tambour Door Cabinet perfectly blends generous storage capacity with a modern design aesthetic. Of the many key features, perhaps the most striking is the clever articulated curtain design that allows quick, easy accessibility while ensuring open doors do not impede on floor space in front of the cabinet. The diverse range of sizes are flexible enough to accommodate all modern office environments, while the smaller sizes have been specifically designed to align with common workstation screen heights to maintain an open plan ambience. Equipped with a signature slimline handle design, the cabinet and door slats are available in a range of colours, including a GECA certified, ABS translucent slat. 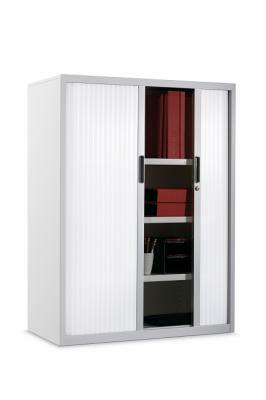 The Strata 2 Tambour Cabinet is fitted with ABS door slats as standard. The Strata 2 Tambour Cabinet boasts innovative full height magnetic strips on the door posts to ensure a tight, secure and seamless finish when doors are closed.